Suffering from a toothache or tooth trauma can be an extremely painful experience. We at 123Dentist wanted to give you some tips on how to deal with a toothache or tooth trauma so you can be as comfortable as possible. In addition to the sharp pains around your tooth, symptoms of a toothache may include fever, a foul taste in your mouth, and swelling around the tooth. When you have a toothache or have just suffered a tooth trauma—it’s best to never ignore any kind of pain in your mouth. Pain is your body’s way of letting you know that something is wrong. If you have any sort of pain in your mouth, make an appointment with your dentist right away. Once you have called your dental office and made an appointment with your dentist, here are a few things you can do. If the edge of the broken tooth is jagged, put a piece of gum or gauze over the edge to keep it from cutting your cheeks or tongue. Try to fit the tooth back into the socket, bite down gently to keep it in place. Use gauze or a wet tea bag for cushioning. Make sure you do not accidentally swallow the tooth. If you cannot put the tooth back into the socket, keep it in a glass with a little bit of whole milk or saliva to preserve it. Apply gauze or pressure if there is bleeding. We provide emergency services to all our patients. 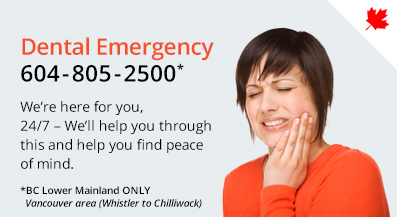 If you are in need of emergency dental treatment, contact our emergency line to find the emergency dentist closest to you today.